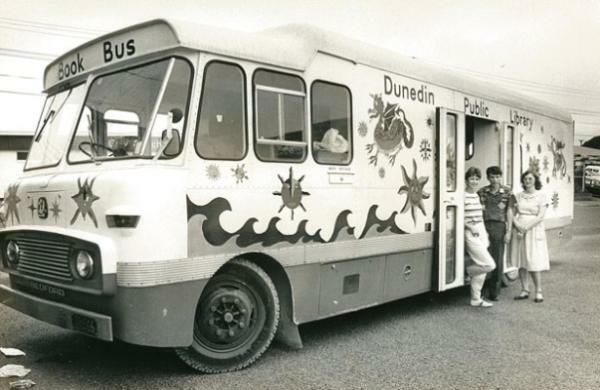 The announcement of the review of the Dunedin City Council Book Bus service is a pertinent reminder to all Otago Peninsula residents of the importance of local services. The review should be treated as an opportunity by the community to consider modernising the services that the Book Bus can supply. These should include WiFi, online services and wider Council customer services. Submissions close on the 27th May 2017 and can be done online or on hard-copy from clicking the link here. The book bus in the 1970’s was decorated by children from Portobello School. 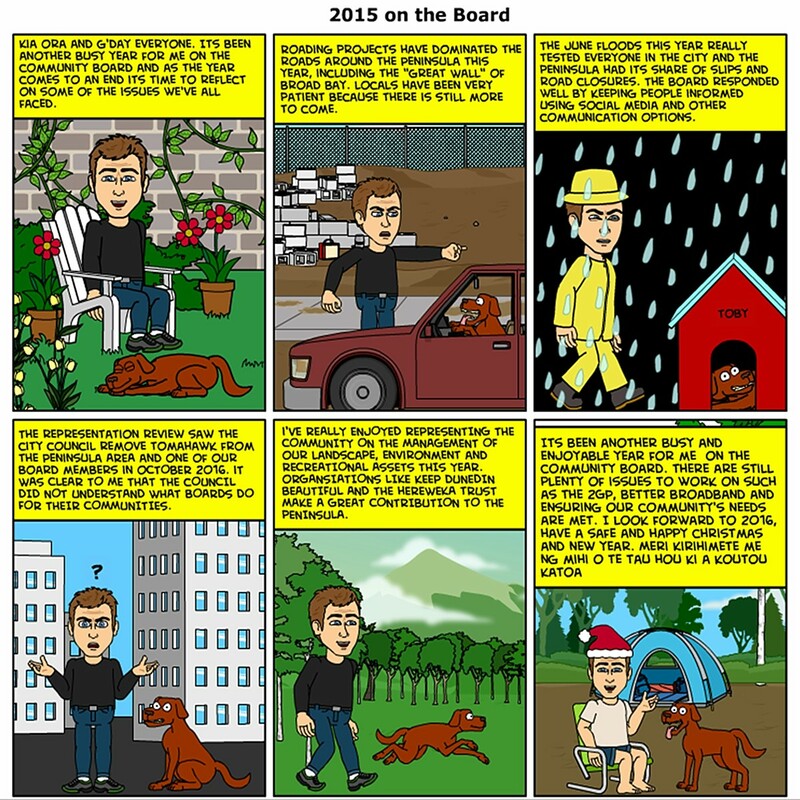 This entry was posted in Broad Bay, Dunedin, Harwood, Local Issues, Macandrew Bay, Otago Harbour, Otago Peninsula, Otago Peninsula Community Board, Otakou, Paul Pope, Portobello, Pukehiki, Tomahawk and tagged Book Bus, Community Board, Dunedin Book Bus Review, Dunedin City Council, Learning, Library Services, OPCB, Otago Peninsula Community Board, Paul Pope, Peninsula Community Board, Reading, Review on May 16, 2017 by Paul on the Peninsula. I’ve been actively involved with community groups for nearly 25 years. I’ve worked with them professionally in a range of roles and issues as well as stepping up in my own community and actively taking part in many of them. They’re an interesting dynamic, some are enthusiastic, positive and embrace new challenges. Others, have very set goals and objectives and seldom deviate from that path. Perhaps the biggest challenge is a community’s ability to develop effective co-ordination and communication between various agencies and local government. Often it is one of the most frustrating things for community groups who can see local government as an impediment to decision-making in the community. How many times do you see in the media, frustrations vented by community groups over what appear to be officious and unnecessary rules? It raises the question, how well does local government actually listen and engage with its community? One of the strengths of Community Boards has been the direct line of communication that they provide between governance and the community. Most importantly they have been able to filter out the differences between vested interests and regional needs through their own understanding of the dynamics of the community. It’s not a perfect system by any means, but its a model that has worked very successfully. In my previous post “Democracy Divided” I was critical of the City Council’s decision to gradually break Community Board’s down and move away from local representation. I made the comment in that post that it “appears that the long-term plan will be to disestablish boards from all communities, and have community groups act as conduits with the City Council. In essence this is a type of community privatisation, where private groups will represent the needs of their community and compete for the small amount of funding in that sector.” There are some fundamental issues with this model, notwithstanding that community groups may not actually represent the views or interests of the community they fain to represent. The Otago Daily Times has confirmed my view recently with the announcement by the Dunedin City Council that it intends “encouraging the creation of more geographically-related community groups across Dunedin, and giving those groups the skills and knowledge to get the most out of the council system.” The article goes further that the City Council wishes to “establish a system to make it easier for community groups to get results” and that “access to advice would be particularly useful for projects such as roading and infrastructure, projects community groups had traditionally found to be difficult.” What such a statement reveals is that the City Council is clearly failing in its own obligations to communicate projects, plans and policies to the wider community. This is significant given that the Council’s annual budget for Economic Development and City Promotion is $15 million. Clearly the question here is, what is this budget being used for and why is the communication that comes out of it failing if people are unaware of Council activities? Its become clear that the City Council are reinventing the wheel for community engagement with the abolition of Community Boards and passing on that role to specific groups. Yet, it’s also clear that the City Council are not looking at why their engagement to date has failed outside of areas that have Community Boards. Which raises another important question, would it not be more useful and probably more successful to develop urban Community Boards to improve the Council’s representation? A final question is, in a city of 120,000 people and 14 City Councillors just how well are those Councillors providing information to their constituents, and is this a case where the so-called “super ward” doesn’t actually provide the level of representation required? As I raised earlier community groups are an interesting dynamic that have a variety of causes, motivations and membership. With this in mind one of my biggest concerns over the City Councils plans is the question of community and representational equity. The limited and competitive funding base for community groups has shrunk over recent years and this trend does not seem to be easing. Which raises further questions about what funding model the City Council would use to implement this plan? From the newspaper article its clear that the City Council may well have to fund additional staffing to ensure the proposal works, but that doesn’t include the annual operating costs that community groups will undoubtedly have. With often stringent criteria for external funding it seems unlikely national and local funding groups are likely to want to fund community groups purely on the basis that they are privatised conduits for Council information services and representation. Importantly too, it seems doubtful that community’s will want a group whose sole focus is the dissemination of Council information and not developing individual projects that meet the community’s needs. One of the biggest issues with this proposal is transparency. Community Boards are generally not agenda driven, but driven by service to the community through an electoral process and the confines of the City’s Long Term Plan. That means that Board members are accountable to the constituents of their district in their decision-making. Community groups are not accountable in the same way. In fact they are only accountable to their membership, which may not be an inclusive representation of the district that they come from. This can be seriously divisive in the community, where people can feel disenfranchised and distanced from those who hold the information, funding and ultimately the power. Other concerns over such a model must be the relationship that the City Council has with a community group. A group who has the “ear of the Council” will be able to forward their agenda or philosophy as the “dominant” view of the community, when often the views within a community are far more complex. There’s also a real danger that groups who hold with a prevailing philosophy popular with Council, may be more likely to be successful with funding and support. That could lead to an inequitable distribution of resources that is politically driven, rather than being based on community need. Finally, there is the question of social equity and the ability to ensure that each community within a district can manage and sustain community aspirations through their local groups. It’s clear to me that poorer community’s and ones without leadership are often the ones who miss out on funding and resources where its most needed. Socio-economic pressures and education within some districts will limit the ability of people in those areas to organise and rally their community. Well educated and well organised community’s are far more likely to be able to be proactive in the promotion of their needs. Coupled with this concern is also how the community and Council will deal with recruitment, group failures, generational change and even an unwillingness of some communities to engage with the process. From my perspective and with my experience, there are significant failings in this scheme by the City Council. Perhaps most worrying is that the City Council seem to want to “manufacture” community groups and leadership to cope with their own failings in consultation and engagement. It simply doesn’t work that way, groups form around central issues that are affecting a community or neighbourhood. They are largely issues-based organisations that evolve into wider entities or disappear once the issue is resolved. By all means we should support and nurture groups within the community, but it must be in a transparent and equitable way. 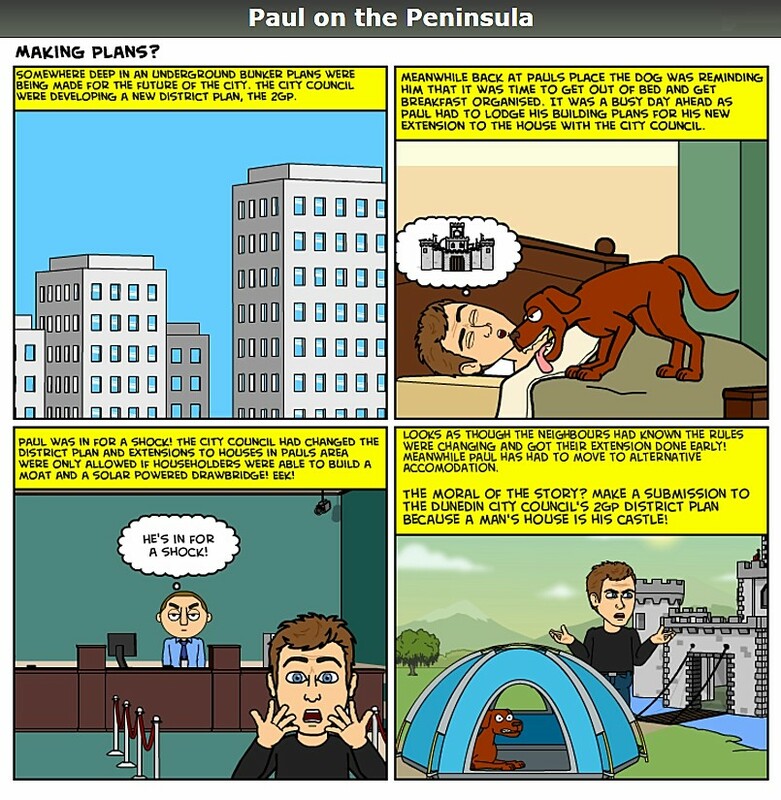 This entry was posted in Broad Bay, Dunedin, Harwood, Local Issues, Macandrew Bay, Otago Harbour, Otago Peninsula, Otago Peninsula Community Board, Otakou, Paul Pope, Portobello, Pukehiki, Tomahawk and tagged Community Aspirations, Community Boards, Community Groups, Community Projects, Consultation, Governance, local government, Paul on the Peninsula, Paul Pope, Representation, Social Equity, Transparency, Urban vs Rural Paradigm on October 28, 2015 by Paul on the Peninsula. Rules to implement the policies. It’s a crucial document to the city, but it’s also one that people need to take notice of and understand how its rules, policies and objectives might affect them. It may change what you can do on your property or the activities that you can undertake. With this in mind its imperative that everyone takes notice of the district plan and participates in the submission process. if there is something that you don’t like about the plan and you don’t submit on that issue, that section could become operative and its much harder to change. I urge everyone to look at the proposed 2GP and at the least look at the maps to ascertain any changes to your property or community. The community only has until Tuesday, November 24 2015 to finalise their submissions. You can view the plan and look at your submission options here. This entry was posted in Broad Bay, Dunedin, Harwood, Local Issues, Macandrew Bay, Otago Harbour, Otago Peninsula, Otago Peninsula Community Board, Otakou, Paul Pope, Portobello, Pukehiki, Tomahawk and tagged 2GP, Broad Bay, District Plan, Dunedin City, Dunedin City Council, Harwood, MacAndrew Bay, Otago Peninsula, Otago Peninsula Community Board, Otakou, Paul on the Peninsula, Paul Pope, Peninsula, Portobello, Pukehiki, Resource Management Act 1991, Resource Management Actr', RMA, Tomahawk on October 20, 2015 by Paul on the Peninsula. 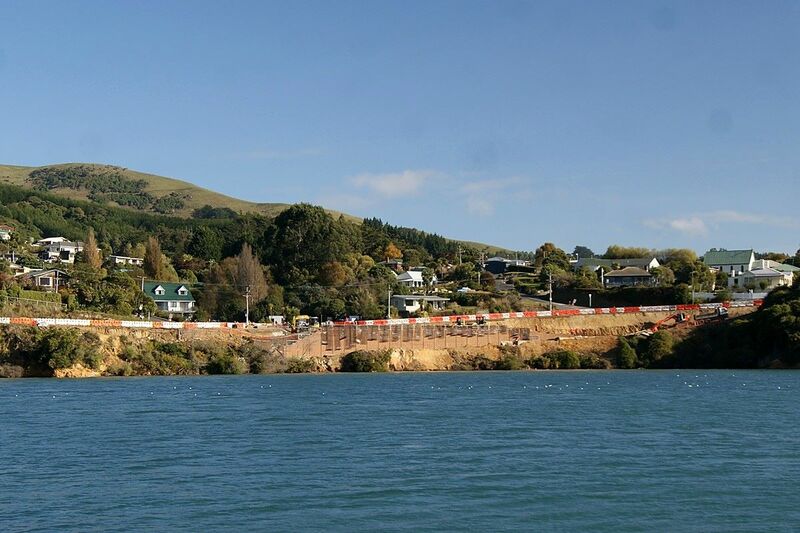 Roading issues occupy a significant part of your time when living on the Otago Peninsula. The slip at Turnbull’s Bay has been a long period of inconvenience that the community have been very patient with as the repairs near their end. 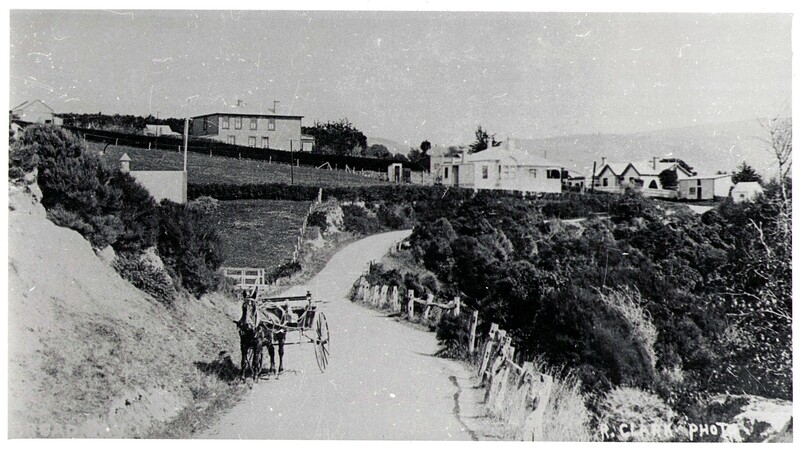 This photograph from the Peninsula Museum illustrates just how much has changed over 100 years since it was taken. 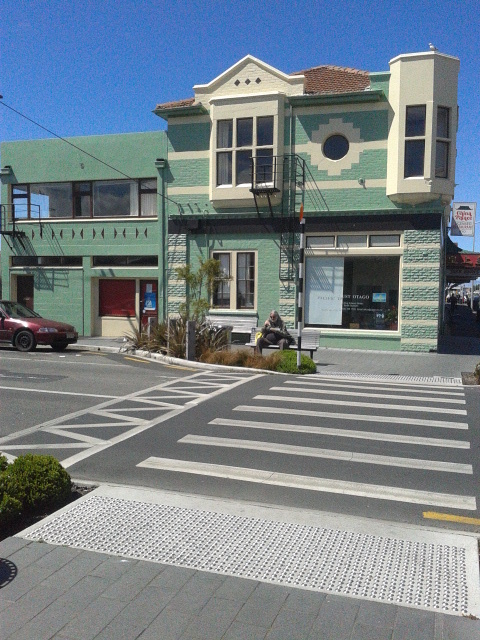 This entry was posted in Broad Bay, Dunedin, Harwood, Local Issues, Macandrew Bay, Otago Harbour, Otago Peninsula, Otago Peninsula Community Board, Otakou, Paul Pope, Portobello, Pukehiki, Tomahawk and tagged Broad Bay, Community Board, DCC, Dunedin City Council, Otago Peninsula, Otago Peninsula Community Board, Paul Pope, Portobello Road, Turnbull's Bay on September 13, 2015 by Paul on the Peninsula. Our first experiences of the environment and biodiversity usually come from our early explorations as children in our backyard and local community. It’s the beginning of our awareness of the natural world and an important step into our understanding of the world around us. 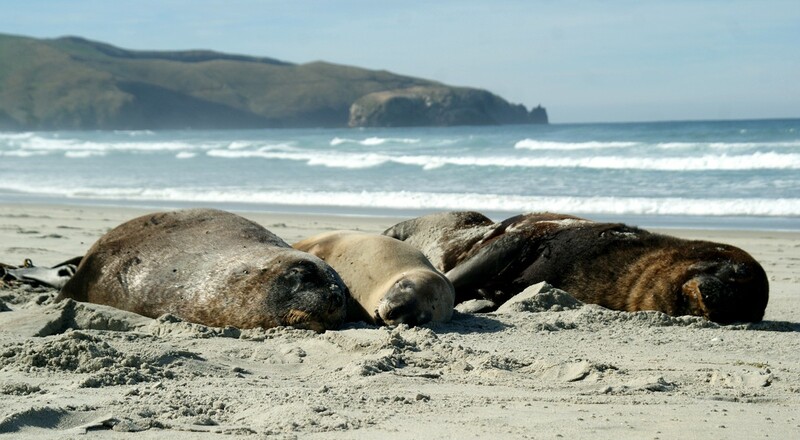 The Dunedin City Council has recently presented Te Ao Turoa – The Natural World as a draft environmental strategy for the City. The proposed strategy lo sets out themes, objectives and priorities for the management of the Dunedin Environment. I was asked to write a submission on the proposed strategy on behalf of the Otago Peninsula Community Board. Strategy documents like this one are highly aspirational, they aspire to high level objectives and priorities. There’s nothing wrong with this as it’s designed to give some direction in a very complicated issue, but the real test of these kinds of documents lies in how they are going to be implemented and funded. The other part of that test is whether the organisation that develops the strategy can ensure that it becomes part of the broader corporate culture of that organisation at all levels. This is a particularly critical aspect for its success. My submission on behalf of the Community Board dealt specifically with the effects of the strategy on the Otago Peninsula. Implementation, communication and the ability of the strategy to be assimilated into the contractual, legal and policy landscape were major themes of that submission. The other aspect of the submission was the acknowledgement of community, business and human resources in the management and conservation of the environment needs deeper consideration. This is directly relevant to the Peninsula as our landscape and environment is so highly reliant on people who act as guardians and stewards of this unique place. It’s always difficult to synthesize such a daunting topic as the environment in a few succinct pages of a submission. The scale of the topic and its complexities means that you always feel as though there’s something you’ve missed out. I imagine that the strategy process will be an evolutionary one as submissions come in from a wide range of people around the city with widely different views. 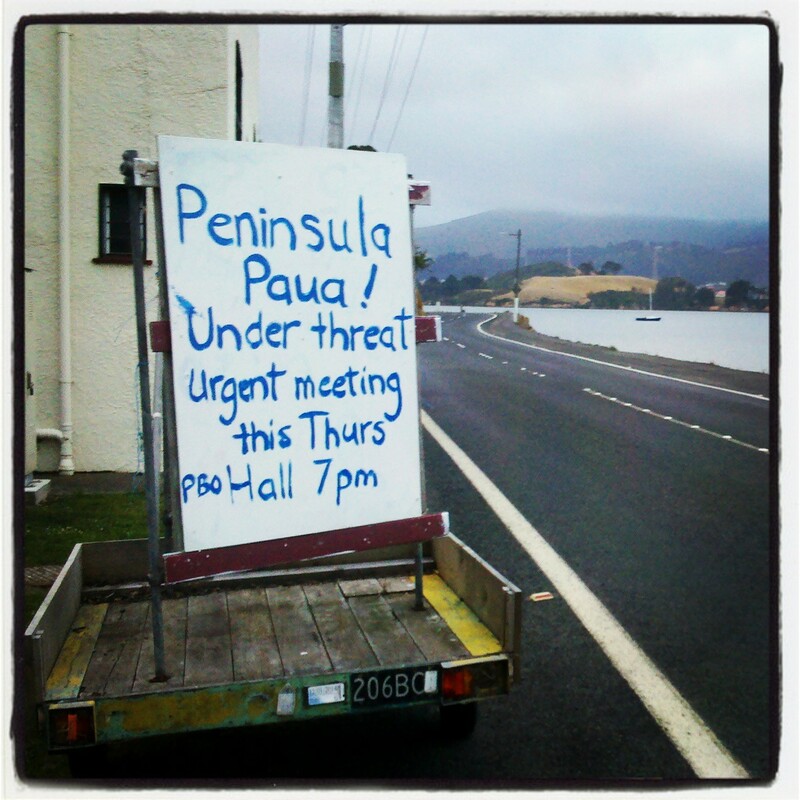 This entry was posted in Broad Bay, Dunedin, Harwood, Local Issues, Macandrew Bay, Otago Harbour, Otago Peninsula, Otago Peninsula Community Board, Otakou, Paul Pope, Portobello, Pukehiki, Tomahawk and tagged Broad Bay, Community Aspirations, DCC, Draft Environmental Strategy, Dunedin, Dunedin City, Dunedin City Council, Harwood, local government, MacAndrew Bay, New Zealand, Otago Peninsula, Otago Peninsula Community Board, Otakou, Paul on the Peninsula, Paul Pope, Peninsula, Portobello, Pukehiki, T Ao Turoa - The Natural World, Tomahawk, Wildlife on September 7, 2015 by Paul on the Peninsula. Many households and businesses have frustrations over the availability and quality of broadband in New Zealand. It seems to be taking forever for the fibre network and rural broadband initiatives to become available for many. The Otago Peninsula is no different and given its importance to the local economy as a tourism destination the need for better broadband coverage is becoming more apparent. At a broader level, business, education and community opportunities are being impeded by not having a reliable and accessible service. No matter what scale business is, the opportunities that broadband provides are immense to improve productivity, the way people work and the way they promote their business. I was asked by the Peninsula Community Board to put together a submission to the Governments Digital Enablement Plan. 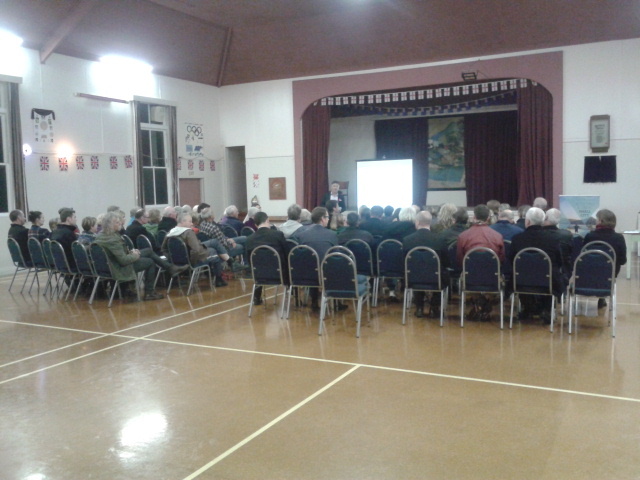 The submission will be part of the Dunedin city Council’s citywide submission on broadband for Dunedin. I would have liked to have placed the direction of the submission from inquiry from the wider community, but time did not allow that. I’ve tried to provide a balance between business and community needs over the broadband issue so that everyone gets a fair degree of representation. I’m still very open to people contacting me if they have any thoughts or queries about the submission. This entry was posted in Broad Bay, Dunedin, Harwood, Local Issues, Macandrew Bay, Otago Harbour, Otago Peninsula, Otakou, Paul Pope, Portobello, Pukehiki, Tomahawk and tagged Broad Bay, Community Aspirations, DCC, Digital Enablement Plan, Dunedin, Dunedin City, Dunedin City Council, Fast Broadband, Harwood, local government, MacAndrew Bay, New Zealand, Otago Peninsula, Otago Peninsula Community Board, Otakou, Paul on the Peninsula, Paul Pope, Peninsula, Portobello, Pukehiki, Rural broadband Initiative, Tomahawk, Tourism, WiFi on September 7, 2015 by Paul on the Peninsula.